You want big bore? You want V-twin? You want cruiser? Well they don’t come much bigger bore and certainly no more V-twin or cruise-worthy than Honda’s new VTX1800. It’s strangely ironic that in a sports bike world, where bigger nearly always means faster, custom bikes seem to get slower as cubic capacity rises. 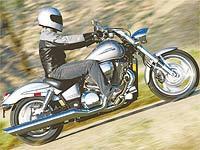 The 1600cc Yamaha WildStar, for instance, though full of torque, hits its rev limiter at a meagre 4400rpm. And the 80-cubic inch (1340cc) Harley Evolution motor, though superior in almost every respect to its 74 cubic inch (1200cc) predecessor, isn’t significantly faster on the street. So when word of the VTX1800 got round, it was fair to say we wondered if it would move at all. Fortunately, my fears were put to rest as soon as I rode the bike. The massive 1795cc engine has overhead camshafts and three valves for each cylinder. And although it’s a big beast at 320kg (704lb) dry, the motor hauls the behemoth through the quarter-mile in 12.3 seconds, with a terminal speed of 105mph. That comfortably leaves all other production V-twin cruisers in its wake (unless you count the V-Max). With over 100ftlb of torque available at 3000rpm, it’s a relaxing ride. It responds quickly to the throttle, and though the staggered-crankpin arrangement doesn’t provide the traditional cadence of a big V-twin, the song from the single muffler is the deepest, fullest basso to emanate from any road-legal exhaust system. The motor is fuel-injected and is never anything more than accurate. It doesn’t seem to drink fuel too badly, either. I got an average of 40mpg over my test, which isn’t bad considering the size of this motor. The seat and bars are typically low slung and the pillion pegs are quick to remove, leaving no obvious sign of their presence for that riding-solo experience. But purists will be displeased by Honda’s use of plastic for the beautifully-sculpted headlight shell, the warning-light housing above the 20-litre (4.5 gallon) fuel tank and other components. On this kind of bike, you expect real steel and aluminium. The ride quality is a bit choppy, and the shaft drive makes the rear end a little bouncy. But there’s very little vibration and it’s comfortable enough to cover some serious distance if you ride it the way it was intended. Its weight may seem a daunting proposition, but when you climb aboard a VTX, your concerns will quickly vanish. With a smooth clutch and a light gearbox, it’s very manageable at low speeds and the weight is carried where it has the least negative impact on handling. Its 67.5in wheelbase and low footrests don’t give the VTX much leaning room. But other than that, it steers predictably, stays pointed where you point it and feels competent on the brakes. Honda claims 1800cc is about as large as a V-twin can get. That remains to be seen. It should be arriving in showrooms in June and is listed at £10,995. For dealer contacts see Bikemart TM (see the top navigation bar) or use the MCN Directory (also above).